It’s a warm, sunny day and you’re out for a nice, leisurely drive. That is until a gigantic storm cloud appears out of nowhere and starts pouring down on your car. You reach for windshield wiper lever, and your wipers make their way across your front window. The only problem is… they’re not clearing off any water. You need new windshield wipers, and you need them yesterday. Fortunately, as long as you can make it home, you’ll be able to buy a new pair. But how do you find the right pair of windshield wipers for your car? By making use of this guide! What Should You Consider When Choosing Windshield Wipers? First up are the Bosch Aerotwin Wiper Blades. These are available for a middle of the road price, offering tons in the ways of construction quality and overall functionality. They measure in at 24 inches and 19 inches, making them more appropriate for cars, trucks, and vans that are on the large size. To figure out whether they’re appropriate for your car, make sure to check your owner’s manual. The frames on these wipers are made out of pure steel, giving them fantastic durability over time. With rubber attachments, they sit flush against the windshield, leaving no space for water to escape at any time. Coming equipped with a pre-mount adapter, these wipers are exceedingly easy to install. Sporting tension-adjusting springs, they apply pressure at all times. For this reason, you can expect a clearly wiped windshield each and every time they make a pass. 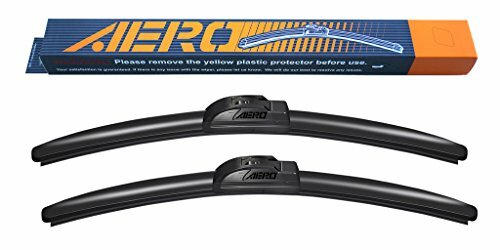 Another very reliable set of 26-inch and 19-inch windshield wipers is this set from AERO. Available for a mid-level price, they offer terrific construction quality and functionality overall. They’re made out of a combination of materials, including plastic, steel, and rubber which are designed to thrive through years and years of use. With a slight curve, they are equipped to break through wind with little to no resistance. They sport a rubber wiper component which glides easily across the windshield while also staying flush at all times. This ensure that they wipe up each and every bit of moisture on each pass. Coming with a 6-month warranty, AERO gives you enough time to determine whether or not they’re going to be reliable enough for you. Overall, this is a very solid pair of wipers. In fact, they’re in the argument for “best windshield wipers” on the market. Next up on our list is this set of wipers from A1 Pacific Inc. Coming with two 22-inch wipers, this set possess fantastic construction quality and top-notch functionality. These wipers are made out of rubber-coated steel, making them resistant to both moisture and physical impact. They’re designed to last through years and years of use. The wiper components on these blades are made out of a synthetic rubber that does a terrific job of applying pressure to the windshield at all times. They come equipped with J-hook adapters, allowing for absolutely seamless installation. In all, they will take around 2 minutes to install. Once they’re installed, they’re extremely aerodynamic, possessing spoilers which reduce wind resistance. Coming with a 1-year warranty, there’s no reason for you not to give them a try. Odds are, they will work out for you. Another fine pair of windshield wipers is the Bosch ICON. These wipers come in a variety of different lengths, from 13 inches to 28 inches, and everything in between. This means that you should be able to easily find the right sized wipers for you. These wipers are very easy to install. They make use of a small hook that latches onto your automobile with just a small manipulation of your fingers. Designed with a slight curve, they stay flush to your windshield at all times, not allowing any moisture to escape as they pass. With a rubber wiper component, they glide smoothly at all times. They’re made out of a combination of steel and plastic, giving them a lightweight, but durable construction quality. In addition, they’re about as aerodynamic as windshield wipers come. The only legitimate negative with these wipers is that they are prone to making noise. A solid pair of budget windshield wipers is this pair from Michelin. These wipers are available in a number of different sizes, from 16 inches to 28 inches. You shouldn’t have much trouble finding the wipers for your car. Sporting a slight curve, they’re designed to sit flush against your windshield at all times. To help them rotate across your window, they’re equipped with a suspension system. They’re made out of a combination of plastic and metal, giving them a durable, yet lightweight construction that can last through years of use. The wiper component on these blades is made out of a synthetic rubber that is specially designed to glide across windshields. Altogether, this is a very solid set of windshield wipers for a very affordable price. If you’re looking for something reliable on a budget, these are a great option. If you’re looking for a solid budget windshield wiper, you might very well be interested in this one from Rain-X. Coming in packs of just one wiper, it’s available in a bevy of sizes from 12 inches to 28 inches. This wiper possesses a natural rubber wiper component which moves slickly across the surface of your windshield. All the while, it applies constant pressure, ensuring that each and every drop on your windshield is eradicated. The frame on this wiper is made out of galvanized steel which is both durable and waterproof. Its only problem is that it’s a little heavy, and is prone taking on wind. Altogether, this is a good, but not great windshield wiper. But for its price, you’re not going to find something too much better. It will work terrifically for you in a pinch. 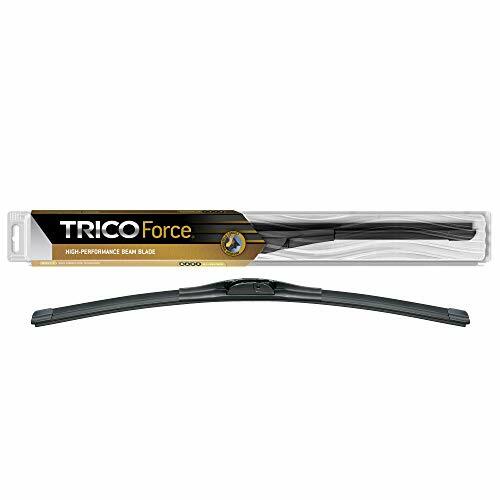 This next wiper blade comes from TRICO, and offers fairly average overall functionality. Available in all sizes from 14 inches to 29 inches, you’re sure to find one for your car. 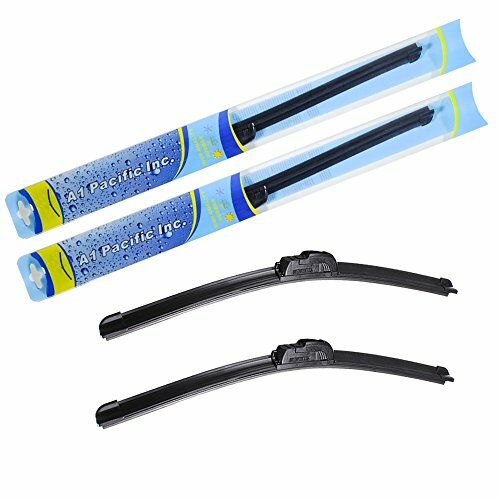 Made out of a combination of metal and plastic, these wipers are both lightweight and durable. This allows them to last over fairly long periods of time; typically a few years. The wiper components on these wipers are made out of a tough rubber which sits flush against the windshield at all times. With a slight curve in the frame of the wiper, it moves across the window with very little disturbance. While these are solid overall windshield wipers, they’re a little expensive. The truth of the matter is that you can find a wiper of similar quality for much less money. If you’re looking for a budget windshield wiper, you might consider this one from Bosch. Available for a mere pittance compared to others on the market, it’s not exceptional, but will get the job done. This wiper is available in sizes from 13 inches to 28 inches, allowing it to be used on cars of all types. Making use of an easy-to-install pin adapter, it can be put on your vehicle with ease. While it will apply decent pressure along your windshield, it typically fails to pick up all traces of water. In short, this wiper doesn’t do as good a job as high-end ones. Again, these Bosch wipers aren’t the greatest wipers on the market, but for most purposes, they will suffice. When used in combination with a high-quality car soap, they will keep your car clean and sparkling. A very similar wiper to the Bosch reviewed above is this one from Panlelo. While it’s very affordable compared to other wipers, it pales in comparison when it comes to overall functionality. This wiper is available in sizes from 14 inches to 26 inches, allowing it to fit on most car models. Coming as just one wiper, you’ll need to buy two separately in order to have them up and running sufficiently. Like the Bosch wiper above, this wiper picks up most of the moisture it comes across, but will still leave trace amounts behind. The point is that these are usable budget wipers and not much else. If you’re looking to save as much money as possible, this is as good an option as any. To finish off our list, we’ll review the ANCO 31-Series Wiper Blade. This wiper is one of the cheapest on the market, available for around half the price of the Panlelo reviewed above. Of course, as you might expect with a cheap product, this windshield wiper doesn’t stand up favorably next to more expensive models. It serves its basic function well enough to get the job done, but will typically leave noticeable amounts of moisture behind. This isn’t to say that it’s awful. You’ll still be able to well enough to drive; you just won’t receive the crystal clear view that you get with high-end wipers. What we’re saying is that these are budget wipers and nothing more. If you’re on an extremely tight budget, they will do. While you may think of all windshield wipers as being exactly the same, the truth of the matter is that they’re all a little different. There are a number of different factors which contribute to the overall quality of wipers. By taking these factors into consideration, you stand the best chance of finding the best pair for you. These factors include length, construction, durability, and compatibility. 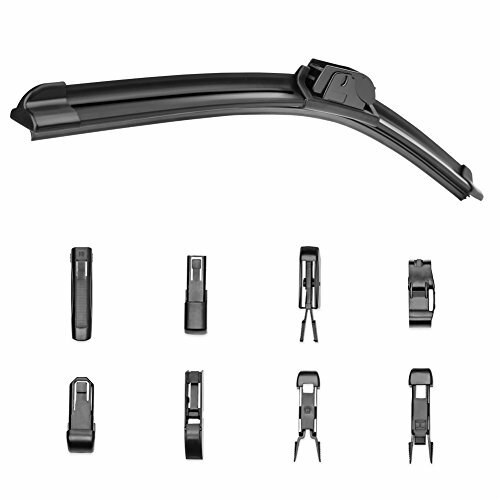 Window wipers are available in a variety of different lengths. Most that you see will range between around 18 inches and 26 inches in length. Odds are, your particular car requires a specific length. If you’re trying to figure out which size wipers your car necessitates, you might find this guide to be useful. All windshield wipers are constructed in their very own way. The primary components of a pair of wipers are the wiper blades, the wiper arms, and the attachment link. To work adequately, the blades need to be equipped with a flexible rubber which can remain flush to the windshield at all times. For the most part, window wipers are made out of two different materials. These two materials are plastic and steel. In all cases, with no exception, steel windshield wipers are more durable. Not to mention, they typically do a better job of wiping windows. Unless you’re buying on a budget, you should opt for steel wipers. The last factor you need to consider when choosing windshield wipers are their overall compatibility. Some wipers are only equipped to work with specific models of cars while others are equipped to work with just about anything. Make sure that you’re buying a pair which play nice with your automobile.